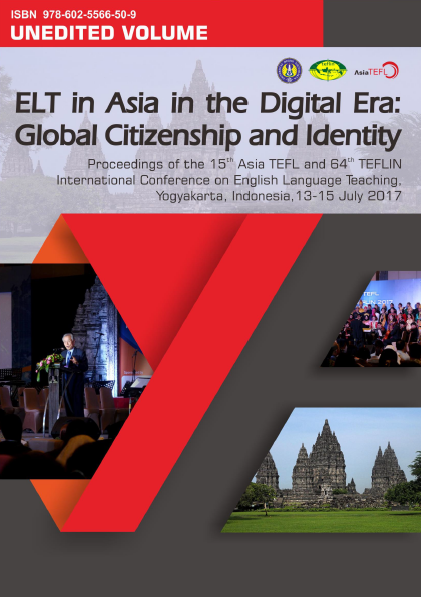 The 15th AsiaTEFL - 64th TEFLIN International Conference is co-hosted by Universitas Negeri Yogyakarta, TEFLIN, and AsiaTEFL to pull together a number of current and critical issues for TEFL researchers, policy makers, and practitioners. They work with the complexity of making significant changes in TEFL policies, beliefs, and practices to improve the TEFL effectiveness for all students in this post-modern era. They also encourage EFL teachers to adjust to changing contexts over time with the focus of serving their students. In relation to this, the conference provides them with ample opportunities to share their experience and expertise. In particular, it is designed to share and examine contemporary conceptions of language learning and teaching and of their change over time leading to an awareness of the need to build language learning and teaching theories with a new paradigm. The 15th Asia TEFL - 64th TEFLIN International Conference meets the criteria of an international conference in the following aspects: (1) STEERING COMMITTEE members from 4 countries: (China, Indonesia, Malaysia, South Korea), (2) The reviewers are the Asia TEFL Executive Council and TEFLIN Board members from 13 countries (China, India, Indonesia, Israel, Japan, Malaysia, Mongolia, Philippines, Russia, Singapore, South Korea, Sri Lanka, Vietnam); (3) Abstracts already submitted from 28 countries (can be seen from the list of presenters in the website).